With equal parts humour, warmth and darkness, and perhaps a pinch of exasperation, he captured scenes which cause the viewer to pause, think and in some strange way even feel a sense of recognition. And this regardless of whether he was using his special palette of vivid colours and harsh flash photography to capture big-box stores in small American provincial towns, Japanese office landscapes or the decline of the welfare state in his place of birth, Borås. 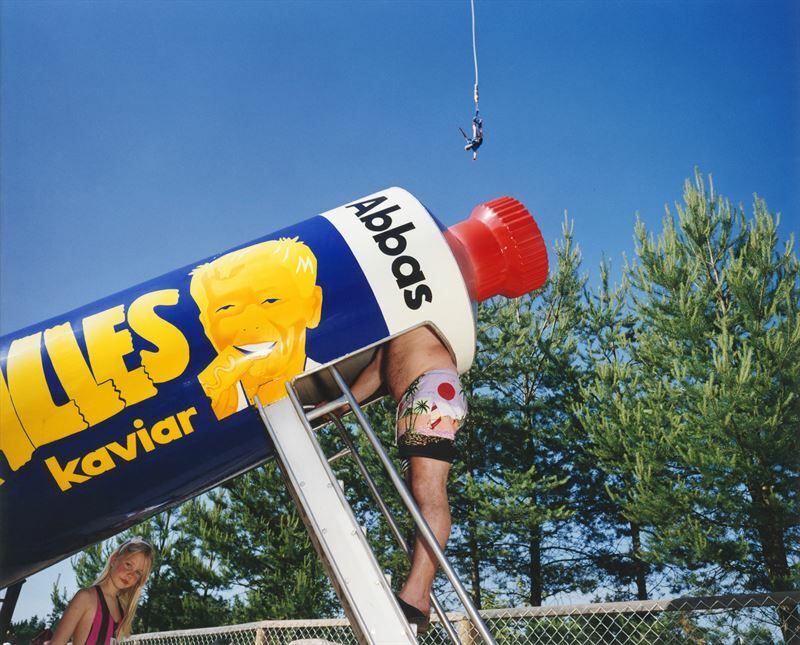 A mark of his stature and influence is that he leaves behind the Swedish expression of a 'Tunbjörkare' or a 'Tunbjörkland', meaning an image or a place with particular qualities, a snapshot reflecting absurd everyday observations and a critical view of life. “Lars had begun planning a retrospective, both a book and an exhibition, before he died. Fulfilling this, his vision, felt very important to me and others around him. I collated Lars Tunbjörk – a view from the side together with Hasse Person, who has also curated Lars' previous exhibitions and followed his work closely, and we've gathered works from a treasure trove of images numbering over half a million exposures. The images feel extremely contemporary even now, at a time when so many cornerstones of the welfare state are being brought into question. Lars captured an early phase of a phenomenon that is gathering momentum,” says filmmaker Maud Nycander, Lars Tunbjörk's wife. Following his sudden passing in 2015, the Lars Tunbjörk Foundation was established to preserve this passionate photographer's entire body of work. Efforts are under way to catalogue and digitise Tunbjörk's photo archive to make it accessible and to enable research. This collection includes works from the series Landet utom sig, Office, I Love Borås, Home, Dom alla and Vinter. And it's images from these series which form the backbone of this major retrospective. In conjunction with the exhibition, a work is also being donated to Fotografiska's collection. In connection with the opening of Lars Tunbjörk – a view from the side, the book Lars Tunbjörk – retrospective published by Max Ström is released. Including more than 250 of Tunbjörk’s most iconic images. “Having the exhibition at Fotografiska, and the book published by Max Ström, is understandably a little overwhelming for everyone involved. Doing justice to Lars' life's work and making choices not knowing what he would have chosen himself hasn't been easy. So we've tried to choose representative images, rather than to reinterpret, and it's wonderful to have the chance to immerse oneself so fully in the work of such a dedicated artist,” says Hasse Persson. At the start of his career, Tunbjörk worked as a press photographer for Swedish newspapers such as Borås Tidning, Stockholms Tidningen, Aftonbladet and Dagens Nyheter. However, it was when he began focusing on the small-scale, the oddities on the outskirts, that his documentary photography took a new turn with a more personal touch. Absurdly surreal images, often in commercial environments, enabled many in the western world to relate, thinking “but that's how things are here too.” Plastic big-box stores putting the squeeze on small, downtown family businesses, bland office spaces, stereotypical environments that popped up like mushrooms across planet Earth. Very apropos even today, with increasingly more cities lacking vibrant city centres. “Lars became the one who documented a transition encompassing spiralling commercialism, the abandonment of traditional meeting places, uglification and the plastic society, a crumbling welfare state. He highlighted this phenomenon before anyone else and was mature enough to undertake it, and in many respects the recognition felt by the viewer sees no borders,” say Nycander and Persson. This documentation and observation of the now meant that Lars Tunbjörk suddenly found himself an internationally acclaimed photographer. The United States, for example, was mesmerised by his work for clients such as The New York Times Magazine, GEO and TIME. They loved how with a unique mix of warmth, humour and darkness he captured and laid bare the moods of places and situations that were not otherwise featured in the idealism of 'the Land of Opportunity'. Parallel to this, he worked on his own projects, which culminated in ten books of his photography, multiple exhibitions and his work being represented in the collections of MOMA, Centre Pompidou and Maison Européenne de la Photographie in Paris. His eye for the absurd and the universal quite simply connects with the viewer regardless of which continent they happen to inhabit. Intuitive photography that strikes a chord in the collective unconscious; photography where he carefully selected a location and then waited for something to happen. Interpreting the starting point as a bold challenge to the status quo is really a given, even if Tunbjörk himself never wanted to define or label what he saw. Just as he was rarely, if ever, satisfied, continually striving to move forward with extremely high expectations for himself. This bon vivant, a charming, slightly reserved man who occasionally, most often in winter, suffered severe bouts of depression. This led to the family making efforts to travel abroad during the darkest time of year, which became increasingly difficult as the children grew and started school. “Then he used it to create something visual instead. His series Vinter, a documentary depiction of Sweden, is just as much about himself, a truly personal portrait. He spent a long time choosing images, sometimes after consulting others, but always with tremendous integrity, always having the last say, and was constantly moving forward,” Nycander and Persson reveal. Following the sudden passing of Tunbjörk in 2015, TIME's Deputy Director of Photography Paul Moakley aptly wrote in his obituary: “Lars made you feel like you weren't alone and that someone else understood the great abyss that stands before us”. Footnote Lars Tunbjörk Prize: The Tore G Wärenstam Foundation in Borås will award the Lars Tunbjörk Prize in conjunction with the opening of the exhibition at Fotografiska, with the recipient invited to exhibit at the Abecita Museum of Modern Art. Footnote press picture: The press pictures is not allowed to be cropped, just for press publishing during and till the end of the exhibition period at Fotografiska. Footnote the Major Documentary Photography Prize: For the first time Fotografiska launch the Major Documentary Photography Prize of SEK 100,000. This year’s winner is photographer and filmmaker Maja Daniels, for her film My friend Barbro, which tells the story of Taimaz, a young refugee who over the course of one year meets and shares his life with Barbro, an older lady living in Älvdalen.